Attucks Middle School in Hollywood is the only all-magnet, all-Cambridge middle school in Broward County. NBC 6's Ari Odzer reports. 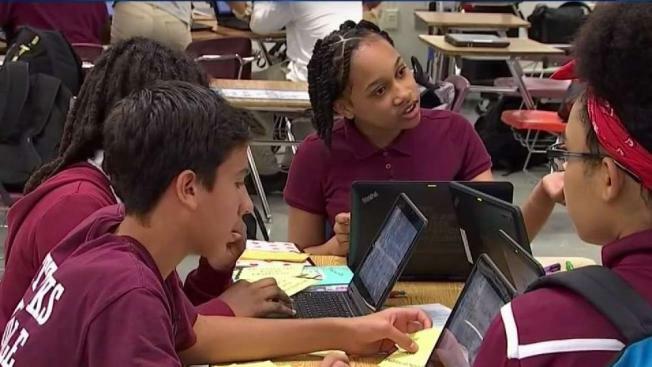 As the only all-magnet, all-Cambridge middle school in Broward County, Attucks Middle School in Hollywood has found a way to set itself apart. "A lot of parents are attracted by that, so they come to our school wanting to make sure their child is advancing and doing well," said Errol Evans, the school's principal. We watched students in the speech and debate class performing their spoken-word poetry. If one were to ask them if that class is more like work or fun, I suspect most would say it's the reason they're excited about school. "Fun and learning go together to make our school a wonderful place to be, every single day," Evans said. Attucks Middle is named after the Revolutionary War figure, Crispus Attucks, and the school likes to think it's doing revolutionary things with education, from an award-winning band to the Cambridge Program. Every teacher at Attucks is Cambridge-trained, and students can take up to 10 high school level courses. "So we want to make sure the kids are actually hands on, they're taking ownership of their education, taking ownership of their grades, their future, trying to make sure they're getting a head start no matter what level they're at, that we're pushing them forward and making them grow," said Audrey Dallaire, the magnet coordinator. Attucks has a TV production and journalism program which boasts a professional-quality studio. The students produce a daily newscast which is treated live on the school's website. "So they research the news themselves, they write all their scripts, they can control and run the entire newsroom without me," said Keytron Hill, the TV production teacher. Attucks emphasizes the Mentoring Tomorrow's Leaders program, in which 8th graders help their younger peers succeed with one-on-one tutoring. Evans says data proves its working, GPA'S are going up, just one of many ways the Attucks Eagles are soaring.